Brickworld Expos are always a cause for excitement around our office. Chicago’s expo was fast approaching and we had lots to do in order to prepare. Being based in the Dayton, OH area these always involve travel time for us and some down time before we head out. So why do we travel outside our usual business radius to and attend Brickworld expos? There is a long answer, a short answer, and an in between answer. The in between. We enjoy the feeling, energy, and excitement of the crowds of attendees when we get onto the expo floor. It is something I advocate all of our readers and clients experience for themselves. LEGO is a timeless toy and one that has many real world applications. You can build almost anything out of LEGO pieces and are only limited by your imaginations. If you haven’t figured out how to build it in bricks you’re probably not doing it right. Brickworld has become more than an expo to us. It has become a home. This year is our first year that we have made plans to attend all four cities where the expos are held. So far this year we have two down. It has become a place that we as a company and individuals have been welcomed and accepted. We are just as excited to see the vendors and exhibitors as they are to see us again. Brickworld Chicago is held at the Marriott Renaissance Hotel in Schaumburg, IL which is a beautiful location that has its own convention center. You’re in the heart of LEGO country here because just down the road is Woodfield Mall which is packed with LEGO exhibits, The LEGO store, and a Brickmania location. If you aren’t prepared to have fun than you are probably going to wind up having it anyhow. There is something for everyone being exhibited on the expo floor. 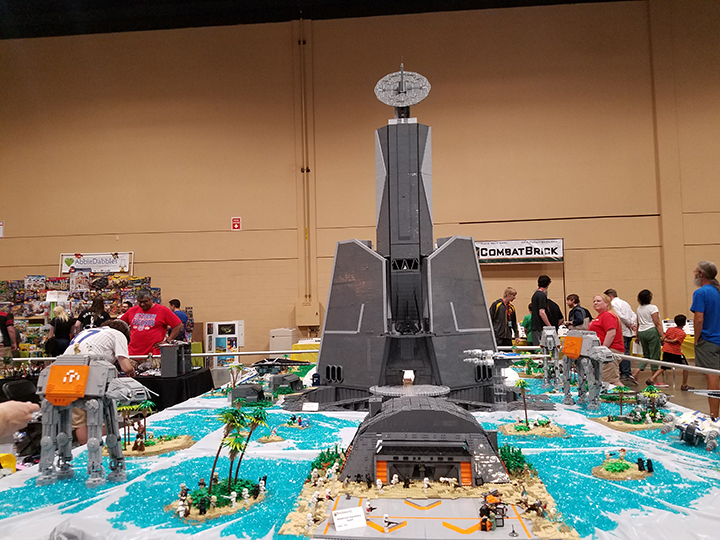 If you have a favorite type of movie or hobby it many very well be featured in a LEGO build by an exhibitor out on the floor. Love Drive-In movie theaters? Well there’s a few of those built small scale and working out on the floor. While coming in beyond the price of admission doesn’t necessarily require you to spend money be prepared to do so. If you are trying to see everything you will more than likely be at the expo all day. There is food for sale at the expo and at restaurants surrounding the hotel area if you wish to leave and reenter. There is a good chance that if you’re a LEGO beginner or a tried and true LEGO fan you will find something you will want to buy at a vendor booth. Come prepared. You’re at a LEGO expo. You’re already half way there. Don’t be afraid to talk to exhibitors and ask questions about their builds. I can assure you that they will love to talk to you and explain their process to you on what went into their display. They didn’t just put together all those grand displays to not tell anyone about them or why they brought them. Talk to as many people as you can. We’re all fans! The Brickworld staff is excellent and helpful as well. They will do their best to answer any questions you might have as well. Let’s not forget the vendors. Even if you can’t afford to purchase something this time around go talk to the vendors. Get to know them. Grab business cards. Lots of the vendors also sell online. They are just as friendly as everyone else there and will answer your questions as well. Many of them will let you trade in other LEGO sets towards new sets you want. Follow these few simple suggestions and we can guarantee you’ll have a memorable time. We love our home away from home at Brickworld. The only problem is where to put all the LEGO sets once we get home.